The forlorn-looking 1954 Super Constellation fuselage sits on a tarmac at Empire Aero Center in Rome, NY. Mechanics at the Empire Aero Center (EAC), an MRO facility in Rome, NY, have worked on impressive planes before. But the small plane that arrived on June 8th looked like a metallic jigsaw puzzle. Never before have they faced the daunting task of reassembling a model, virtually from the ground up. Known as the Lockheed "Super Constellation," this bonafide 53-year-old antique is so unique that its rediscovery has set the aviation world abuzz. It turned plenty of heads even before it arrived at EAC. Indeed, a plane carted along the back roads of rural northern New York and the Adirondack Mountains, starting in Toronto and arriving in a convoy of five flatbed trucks will stir the curiosity of lots of people. It's now safely harbored behind the gates at Empire Aero Center at the Griffiss Business and Technology Park. Catherine Scott of Mississauga, Ontario, the owner of the plane, sold it recently to the Museum of Flight in Seattle, Wash. EAC's job is to restore and reconstruct the gem to near original condition and then ship it, via truck again, to the museum. The plane will never fly again, but will make a good display. The 1049G model was built by Lockheed in Burbank and delivered to Trans Canada Airlines on May 10, 1954. The Lockheed Super Constellation is the last of its kind. Nicknamed "Connie," it was in production only from 1939 to 1958 and the early Connies saw a lot of action during World War II. Restoring it to its near original state is going to be a Herculean task. "It's a big job to tackle, for everyone," said Randy Buol, vice president of maintenance at Empire Aero. A subsidiary of Israeli Air, EAC is a maintenance, repair and overhaul center with a total of over 500,000 square feet of space in four hangars. The daunting task started as soon as it arrived. "It took two hours to get it through the (EAC) gate on Hangar Road," he noted. EAC needed three cranes to lift the fuselage off the truck and set it down on the tarmac. Hours earlier, it raised many eyebrows as it crept across the Canadian-U.S. border. Even though it traveled a prescribed state-approved route to get to the City of Rome, there were still unanticipated obstacles. When it started up Floyd Avenue toward the Griffiss Business and Technology Park, the wings and fuselage were too wide to negotiate one of the main thoroughfares. The truckers, with the assistance of the Rome Police Department, were forced to turn the convoy around and bring it in to EAC via the west entrance to the park (State Route 825.) The trip from Canada to Rome, NY took 18 grueling hours, more than four times longer than normal. 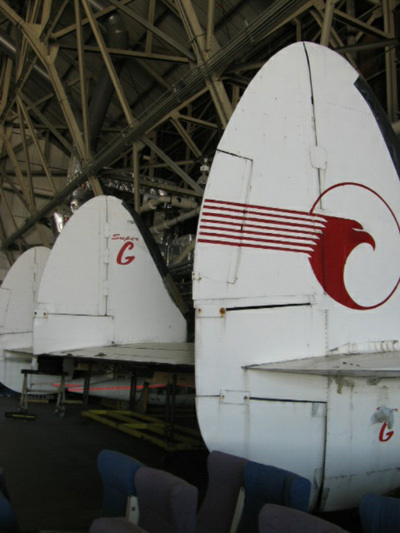 A few months ago, EAC was contacted by Air Canada (originally Trans Canada) about restoring the Super Constellation. EAC had already serviced and repaired several aircraft for Air Canada this year. EAC has the capacity to do major aircraft maintenance, it has one of the largest hangars in the Northeast. 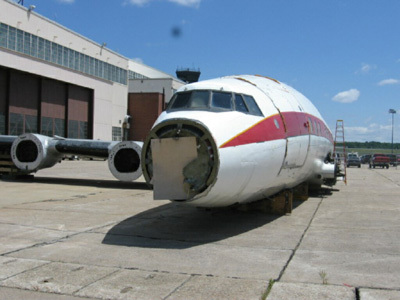 Their close proximity to Toronto, and "It's also about our quality work," said EAC's Buol, that helped them get the contract to restore the airplane. Quality, not to mention ingenuity, will be a valuable commodity on this repair job. "It's been neglected for five years," said Buol, a former crew chief for the U.S. Air Force. This Connie's flight history has been lost in the dustbin of history, but it has no airworthiness," he added. "It was in a storage yard in Toronto and exposed to the weather for years. We've been evaluating it and discussing it with the museum every week. They want it done in early fall, but it's going to take at least a year. I don't have a truthful time frame until I can set it all down on paper." A view of the cockpit in the 1954 Super Constellation. The first step is to attach the wings and then repair the nose gear, which arrived with a flat tire, and broken gear struts, brackets and inner piston. "We'll have to make them new in our machine shop," he said. He assigned two lead mechanics, Kevin Lacey and Tim Buchholtz, to do the preliminary evaluation and set up a timetable. For Lacey, a former Air Force structures mechanic and an aviation buff, this is a dream job. "When I first saw her in Toronto, in April, I was excited to have the opportunity to work on something like this," he said. "I'm sure she had a colorful past." "I have never worked on anything of this size. Course, when I worked on planes in the Air Force, they were never torn apart like this," he joked. His enthusiasm for the job, however, is tempered by the skeleton's poor condition. "It's all in pretty bad shape," he said. "The landing gear has to look more than pretty, it has to be structurally sound. There's no question, it's going to take us at least a year. We want it to be restored for the purposes of looking beautiful, and to give people an idea of what it looked like when it was in service." Nevertheless, as he admired the bruised exterior, it was like discovering a diamond in the rough. "This is a real solid body," he said. "These days, they know how to use a lot less metal and still get the same strength." The plane's colorful history is connected to billionaire pilot Howard Hughes. Hughes had purchased controlling shares of TWA in 1939 and assumed ownership of the company. However, the antitrust legislation included in the 1934 Air Mail Act, prohibited Hughes from building his own airplanes. EAC mechanic Lacey said that didn't stop Hughes. "He wanted an airplane that would outperform TWA's fleet of Boeing 307 Stratoliners. He was on very good terms with the folks at Lockheed Corporation and an agreement was reached between Hughes and Lockheed to secretly develop the airplane. The result was the revolutionary Constellation. TWA bought 40 of them right off the production line." Connie was retired from service in 1962 with 19,273 total hours. 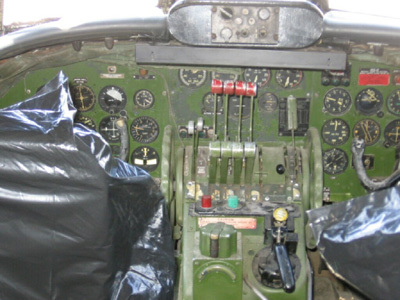 It was put into storage, though its cockpit and instrument panel remained intact. In fact, the communications equipment behind the engineer's seat, including Bendix radios, are still on board. These particular transmitters, control boxes and receivers were made in factories in Baltimore, MD, and Miami, FL. At the present time, the Aviation Museum in Seattle does not intend to show the interior and it's not part of EAC's contract. In 1968, Connie became a restaurant and was attached to another building on the fringe of Pearson International Airport in Toronto. The seats were converted into booths. A finely-crafted wooden bar that cost $30,000 was also installed and is still on board. Despite its originality, the restaurant didn't last more than a year. In 1996, it became a conference facility parked outside the Regal Constellation Hotel in Toronto. The plane passed through many hands previously before Catherine Scott purchased it. Empire Aero Center will not hire additional workers for this particular job. However, EAC is sticking to its goal of hiring 12 to 15 workers each month.